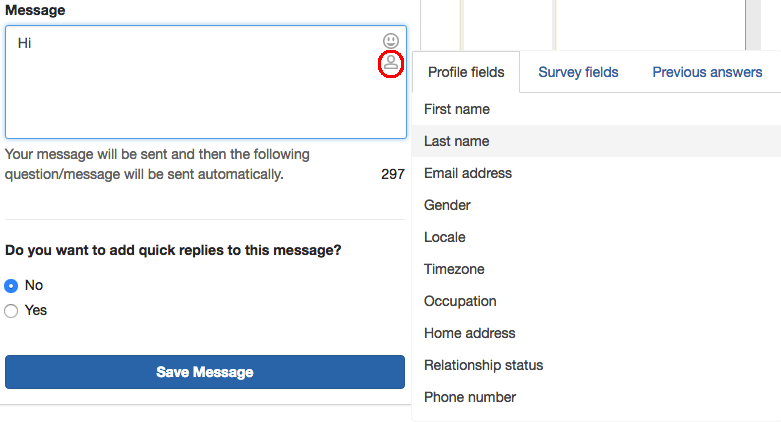 Surveybot makes merge fields easy, opening with a simple click and letting you select from a list of options. You can use a merge field to use available or collected data about your audience in your surveys. An example of this is using people's first names in your welcome messages to create a more personalised experience for your users. You can also use our merge fields to show a user how far they have gotten on a survey, or to reference their answer to a previous question among many other options. Creating merge fields on Surveybot are super easy. You just click the icon circled in red in the below image and select your desired option from the menu.